Cranchi Florida has been servicing the boating community since 2001 and has earned the well deserved respect in South Florida and the marine industry. That's why they take pride in carrying out the Cranchi mission to supply boaters with technological sophistication and Italian styling combined with 132 years of unequaled master craftsmanship in boat building. Cranchi's waterfont location displays the full line of luxury Cranchi vessels from 27 to 50 feet. They are dedicated to providing their customers with the most professional and knowledgable information regarding all aspects of these boats. No team works harder to assist you in making your yachting experience as pleasurable as possible. Cranchi also offer a variety of special options such as European Delivery and Pre-Owned Certification. They look forward to beginning a new and flourishing relationship with each and every one of our clients. That is the spirit of Cranchi. The Cranchi Sport Line captures the emotions right from the first glance, with it's pure lines, elegant looks, dynamic performance and quality without compromise. These are all features which you come to appreciate, and which help make Cranchi the most reliable means for achieving such goals. Lively, seductive and racy, these vessels have hidden capacities, such as the surprisingly spacious cabins beneath the prow, the large number of compartments for the stowing of objects, the cockpit sofas that can be transformed into sun loungers, all solutions that bear witness to the remarkable design abilities of Cranchi, in creating new spaces on board.Water skiing enthusiasts will find the ideal partner in this class of vessel, with powerful, lively engines guaranteeing high performance in all situations. The maneuverability is excellent and fuel consumption and maintenance are reduced to the minimum. The rich standard series equipment, insistence on comfort and attention to detail make the time spent on board an extremely pleasant experience. At first glance you will see that the CSL 27 is already making an impact in the North American sport boat market. The side profile is aesthetically pleasing to the eye with sleek and stylish lines. The CSL 27 features plenty of freeboard which, combined with a 9 foot beam, keeps you safe and secure in the roughest of water and in the tightest turns. The dynamic performing hull is made from hand-laid fiberglass with layers of Kevlar reinforcement, thus utilizing the strongest and best construction methods where nothing is compromised. The roomy cockpit features side by side power seats which can spin around to face the rear which are Ideal for entertaining guests on warm afternoons by the dock. The large aft sun pad is stylish and safe with guard rails around the trim. A sink, cutting board and cockpit refrigerator are conveniently located on the starboard side. There is even a transom shower and walk-thru windshield. Down below the surprisingly roomy interior compromises nothing. There is plenty of head room in the cabin, so you can use it as a lounge and dining area or convert it into a comfortable sleeper for two. The CSL 27 cabin area also comes complete with a full porcelain marine head. However you choose to use this exciting new sport boat, it will not disappoint you. Whether you are looking for a boat to break into the luxurious European market or you are an avid boater looking for a weekend speedster, the Cranchi CSL 27 will more than satisfy your needs. The CSL 28, was the first model introduced in the in the Cranchi Sport Line. This dynamic Sport Cuddy features outstanding performance and quality without compromise. While building this boat, the factory kept in mind all the principles which are most important to the customer: reliability of the hull and the motor, optimal weight distribution (central command bridge), comfort, design, the ergonomic distribution of all the on-board equipment, beautiful detail, high quality materials and a minimum of required maintenance. Cranchi's technicians, engineers and designers are all passionate boating enthusiasts who dedicate themselves to boat design on the basis of their central principles. Their careful and reasoned planning leads to the development of NATURALLY EXCELLENT models that are always distinguished by their elegance, innovation and originality. Cranchi are proud to be considered the leaders in innovation in the industry. When they launch a new model on the market it only stimulates their competitive and creative spirit further. In just 28 feet Cranchi have succeeded in creating a fast sport boat with big boat luxury. Does such a thing as a perfect vessel exist? Probably not. But at Cranchi they know they're heading in the right direction in their mission. Safe and highly advanced technologically, with modern, elegant lines hinting strongly at past tradition. These vessels were designed with a view to comfort and the ability to get the very most out of life on board. They are designed to accompany you on your cruises, no matter how short or demanding, offering a safety factor and seaworthiness that are incomparable at all times. A good cruising speed, excellent autonomy and reduced fuel consumption makes any boat in this class the ideal companion for unforgettable cruising experiences. Wherever your adventures take you, these vessels will always live up to your expectations. Luxurious to just the right degree, without excess, they unleash the classic magnetism of a vessel well designed and even better built. It's difficult to think of a more complete "family-styled" model. Here, everything has been created around the idea of comfort, to make life onboard evermore pleasant . The Zaffiro 34 is built in one of the most industrialized boatyards in the world which has produced craft with unaltered commitment and limitless passion since 1870. The Zaffiro 34 features two state rooms spacious enough for weekend getaways or extended cruises. This vessel is designed for cruising, offering safety and seaworthiness which is incomparable with other boats of this size. It has all the quality workmanship and the highest quality materials which you would find in their larger models. 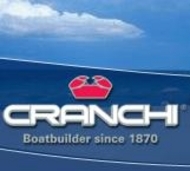 The quality of Cranchi boats has always been recognized and appreciated for the impeccable industrial process with which Cranchi's factory produces each model. The Zaffiro 34 is no exception. The Smeraldo 37 brilliantly represents all the advantages of modern design. It is a Master Cruiser that for quite some time has enjoyed a loyal and enthusiastic following world-wide. With its new teak bathing platform, the Smeraldo 37 is even more rugged, with even smarter, crisper lines. This beautifully crafted vessel features two state rooms spacious enough for weekend getaways or extended cruises. It is designed for cruising, offering safety and seaworthiness which is incomparable with other boats of this size. It has all the quality workmanship and the highest quality materials which you would find in their larger models. The Smeraldo 37 is a complete Master Cruiser that satisfies the requirements of those who love comfort, but not at the expense of performance. With its considerable autonomy and reduced consumption, it becomes the ideal boat for any type of cruising, with the constant guarantee of reliability and the sheer pleasure of sailing. The ultra-modern Endurance 33 was developed over a short time period thanks to the use of continuously developing technologies in the design and production stages. Its many innovations, daring lines, and superior styling make it a real preview of what the future of boating has in store. On this boat you will be surprised and delighted to find very few traditional elements and designs. It’s unexpected qualities will quickly make their presence felt as you cruise along the open water. Cranchi can assure you that this beautifully crafted vessel has achieved worldwide recognition for seaworthiness and performance levels of the highest standards. It was the experience and unceasing research and analysis of the designers and architects for the Endurance 33 that produced this very special boat, one designed to meet a single criteria: perfection. The Cranchi Flybridges are safe, reliable vessels, built using the most modern technology and only with the finest quality materials. The company's great know-how can be found in the impeccable way Cranchi process glass fibre, a precious material that conceals no secrets from them, in the absolute precision of the robots that spray on the gel coat and the on-board systems, in which severe industrial planning standards leave no space for any imperfection. But it's in Cranchi's attention to detail, the care they take over the finishings carefully applied by their specialists, that you can see the vast gulf between a Cranchi and another vessel. And there's more - refined fittings, with the possibility of choosing from 3 different versions of the interior decor, all of which have been designed to convey the marine atmosphere of the Mediterranean. Colors creating well thought out movements and recall the incomparable transparency of the air and water. Colors that reflect different styling sensitivities and give the craft its own individual character, to ensure that the vessel is a residence par excellence. The Atlantique Series features a solid fiberglass hull lay up (rather than the cored process) combined with a lightweight Kevlar flybridge. This combination makes for a dry and stable ride and does not have the rock-and-roll characteristics that many of their competitor's boats have. Further to this, Cranchi's motors are mounted low and forward amid ship along the axis line which also contributes to the incredible stability and performance of this vessel. The Atlantique 40 features dual helm stations which are unusual for a boat this size and with characteristics of very little bow lift, the visibility is excellent from the double wide captain's chair. The galley is uniquely and conveniently located adjacent to the helm seat on the same level which allows for everyone to be part of the conversation. There are two staterooms aboard with two full heads for your convenience. The Atlantique 40 features leather furniture, cherry wood curved doors and cabinets and outstanding detail to fit and finish. There is excellent cross ventilation and headroom inside and easy access to the flybridge and foredeck where you will find sun pad areas in both areas. This beautifully crafted vessel features elegant lines with extraordinary seaworthiness and performance levels of the highest standards. The Atlantique 50 is the largest of Cranchi's flybridge motor yacht series. Despite the sheer elegance of the vessel, there is plenty of solid construction and performance attributes that make the 50 one of the safest and stable flybridge boats on the market today. This boat features a solid fiberglass hull lay up rather than a cored process. Combined with a light weight Kevlar fly bridge, this process makes for a dry and stable ride and does not have the rock-and-roll characteristics that many of Cranchi's competitor's boats have. Further, the engines are mounted low and forward amid ship along the axis line which also contributes to incredible stability and performance of this vessel. As you board the boat you will notice the teak cockpit sole and swim platform which provides plenty of room for lounging and entertaining. The seating and storage in this area are excellent and provide easy access to the ladder for the flybridge or for a stroll around to the front. The double coated stainless steel grab rails are strategically placed and are mounted where they are needed most. The lockable stainless steel sliding doors glide effortlessly as you enter the salon. Once inside, the cherry wood fit and finish is striking and is complimented with leather sofas and modular seating. The lower helm station features a double wide Captain's chair and due to the characteristics of very little bow lift, provides comfort and excellent visibility. The fully complimented galley is uniquely and conveniently located on the same level adjacent to the Captain's chair. On the lower level there are three staterooms on board with two full featured heads. Plenty of headroom, Indirect lighting and stunning cherry wood cabinets and curved doors provide elegance with a nautical ambiance. The Atlantique 50 has achieved worldwide recognition with elegant lines, extraordinary seaworthiness and performance levels of the highest standards. Safe and highly advanced technologically, with modern, elegant lines hinting strongly at past tradition. These vessels were designed with a view to comfort and the ability to get the very most out of life on board. They are designed to accompany you on your cruises, no matter how short or demanding, offering a safety factor and seaworthiness that are incomparable at all times. A good cruising speed, excellent autonomy and reduced fuel consumption makes any boat in this class the ideal companion for unforgettable cruising experiences. Wherever your adventures take you, these vessels will always live up to your expectations. Luxurious to just the right degree, without excess, they unleash the classic magnetism of a vessel well designed and even better built. Sufficiently luxurious without being excessive, this boat emits the classic magnetism of what has been well designed and even better produced. High performance levels, an excellent se holding, good cruising speeds and limited consumption make this the ideal companion for an unforgettable seagoing experience. This is where Cranchi strive for perfection. A striving that at times might seem excessive and obsessive, but which has led to the major solutions found in the Mediterranee 47. On board space without limits. Comfortable, safe and highly advanced from a technological viewpoint. The Med 47 displays modern, elegant lines, but with strong references to tradition. The Mediterranee 50 is the flagship of the Cranchi line and has achieved worldwide recognition for being a solid state-of-the-art and beautifully crafted vessel. At just over 50 feet, the Mediterranee 50 sets the standard that all offshore express cruisers should be measured. The stylish cockpit area is roomy and loaded with features that will stand out at a crowded dock. While at sea, you will find that everything is ergonomically designed for your comfort and ease of use. You will appreciate the tedious attention to detail and finish more and more every time you take it out. Down below, the enormous cabin features 3 private staterooms and is complete with 2 full marine heads. The side dinette is large and will seat several people comfortably. The 6 side stainless steel portholes and 3 circular hatches in the deck give you plenty of headroom and natural light. In the galley, you will find an abundance of usable space and plenty of storage with a place for everything you could possibly need while cruising on your Cranchi. The fit and striking finish of the cherry wood doors and cabinets will impress every guest with the elegance of dining on your boat.